Even some of the world's most intelligent minds balk when it comes to making numbers work. Math equations filled with letters and strange symbols just don't add up for some people. Now, for the numerically-challenged, a new app has been invented to be your own personal number-cruncher. According to einfolive.com, the PhotoMath app works by analyzing a picture that you take of a printed equation. It then shows you step-by-step how the equation should be properly dealt with, demystifying the mathematical process so that the user eventually may be able to apply the same principles sans smartphone. 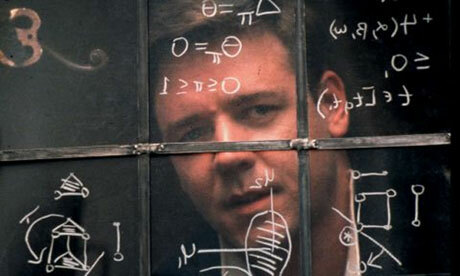 For those without "A Beautiful Mind", now you can fake it. Russell Crowe not included. The process PhotoMath uses is called Optical Character Recognition. First, it scans the desired text. Then, it filters and enhances the equation's text, removing anything not required for the solution by extracting the equation's features. Finally, the characters will be recognized by the app, and solved as you follow along. The app works on a variety of math problems, including regular arithmetic, fractals, decimals, exponents, roots, and simple linear equations. It cannot currently solve equations that are hand-written, but is able to deduce text coherently from standard printed pages. PhotoMath works on Windows and iOS phones, with an Android version launching in 2015. Ironically, the PhotoApp's amazingly useful features were created by MicroBlink, who were otherwise involved in developing photo recognition software that many malign as invasive and creepy when used for surveillance. At least one good thing has come out of this cyber-scrutiny: the ability to teach a useful life skill in simple steps. If only all of technology's evil plans had such a good side. It's basically this, except inside your phone. Most of the students fear of math and some students enjoy it, although the math subject is not a piece of cake which everyone can easily understand it, well you discussed about the PhotoMath app that can solve students’ problem, if we see in the past there was very difficult to study, but nowadays developers solve all the problems almost there are thousand and millions of apps that every person can easily access and use it for their personal work that make the work easier and simple I work for work experience credits where we offer accredited work experience degree for only those who have some experience and skill in the specific field so people can easily acquire, in the same manner these apps are also working great for us. This app clearly shows that there is no limit to innovation and creativity. I am a professional mobile app developer graduated from Payne Springs University and pleased to share that I have worked on a couple of similar projects. Get this t mobile family where app that is a great helper for every parent. Great! It's very good when you can use different applications and technologies during your educational process. I've faced this opportunity when I was looking for someone to write my best essay . I was searching for such people everywhere and hopefully I found one on the college forum.